Malnutrition occurs when a nursing home resident is not provided with adequate vitamins, minerals, protein and calories. 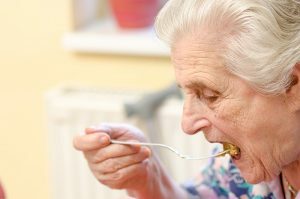 Malnutrition never should occur in a nursing home because the facility has a responsibility to do a nutritional assessment on all residents and to ensure that residents receive well-balanced meals with assistance with eating, if they require it. There are a number of steps that can be taken to prevent malnutrition in an assisted living or long-term care facility. The nursing home staff should be aware if residents are not eating. If residents need assistance with feeding themselves, an aid should be present to feed the resident. If the resident is having difficulty swallowing, a feeding tube can be inserted at the direction of a physician. Malnutrition causes a wide range of serious problems, including low blood sugar, muscle weakness, dizziness, falls, and decreased immunity, leaving the elder person susceptible to infections. It can be fatal. When nursing home negligence results in malnutrition, you have every right to hold the nursing home accountable. For more than 40 years the lawyers at Solomon & Relihan have been helping victims of negligence in Arizona. We were the first law firm in the state to file a nursing home punitive damage case â€“ and win. If you believe that your loved one lost weight or became malnourished because of nursing home neglect, contact us for a free, confidential consultation. When your loved one enters a nursing home, it is critical that you monitor his or her physical well-being. On visits to the nursing home, watch for unexplained weight loss, increased weakness, or a gray or yellowish skin color. Your loved one may seem confused or non-responsive. If your loved one needs help eating, the nursing home should make sure he or she is being fed and is allowed enough time to eat (sometimes an hour or more, depending on a personâ€™s needs). Is the nursing assistant rushed? Staff members may not permit your loved one enough time to chew and swallow. This can lead to choking, aspiration of food, and pneumonia. If your loved one eats at his or her bedside and is left unattended, make sure he or she has eaten the food before the tray is taken away. Sometimes overworked and underpaid staff members rush nursing home residents through meals. At Solomon & Relihan, our attorneys understand the seriousness of the responsibility we have to our clientsâ€”to do the very best we can for them. Our work begins with using legal strategies designed to achieve favorable settlements and jury verdicts. If you suspect that someone you care about has been neglected or abused in a nursing home, take action immediately. Speak with a lawyer experienced in malnutrition lawsuits against nursing homes, assisted living centers and long-term care facilities.